Driving up to our home, it’s hard to forget that it hasn’t always been in that spot. For the first 110 years, the white farmhouse sat on the other side of Roseburg, nestled into the trees along with a smaller home and barn on N.E. Winchester Street. Local hotel owner D.C. McClallen had the home built for his family in 1895. Although the McClallens weren’t native to the Umpqua Valley, they were well respected in the community. It would seem that the house was built shortly before McClallen and his wife passed away, a couple of years apart. Soon after, it is believed one of the McClallen grandchildren occupied the house. Over the years, other well known families have owned the property. Pete and Nelle Motschenbacher moved to the Winchester Street location in 1941. Their daughter, Susan, remembers raking leaves in the front yard as the news broke that Pearl Harbor had been bombed. As a teen, Susan spent summer nights sleeping on the front porch. She recalls cool summers and large parties her mom loved to host in the front yard. Susan’s mother, Nelle, worked for Roseburg Lumber owner Kenneth Ford in those days and her yard parties were well known throughout the Umpqua Valley. Another popular feature was the fish pond that spread 10 feet across the front lawn. In 1996, Nelle was unable to continue living in her beautiful family home and passed away shortly after moving out. Susan’s daughter occupied the residence for the next four years until the family decided it was time to sell. With a few bits of history woven throughout the piece, it was asking the public for help in finding someone who would be willing to save this bit of history from being torn down. The owner at the time, Cascade Community Federal Credit Union, had been advertising the house for months with no real prospects. A friend of ours suggested we take a look to see if there was something we could do with the home. He had plans to mention it to my husband, Russ, but I made it clear he was to keep it to himself. 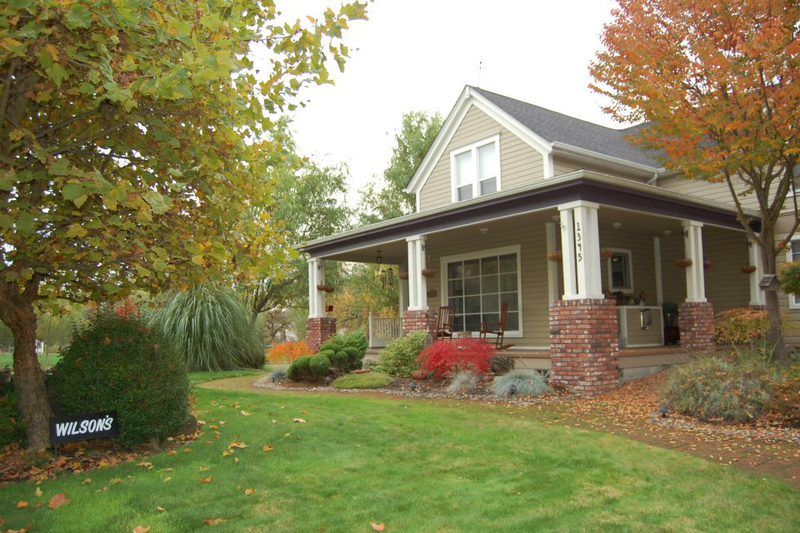 While Cascade was looking for someone to move the house, our family was settling in to our freshly renovated home on Calkins Street in Roseburg. For the first 15 years of our marriage, we moved every two years. Purchasing a home that needed loving care, he’d fix it up and we’d move on. It was never planned that way. Each time we’d say, “This is the one we’ll stay in.” Of course, something else would catch his eye and we’d move again. Weary from renovating and breathing in drywall dust, I was settled into our sweet traditional home. But it wasn’t long until he caught wind of the opportunity to save a piece of history. Almost one full year after the printed plea in The News-Review, Russ made a proposal to Cascade. The offer to move the home and remove the remaining buildings from the property was excepted. Moving a home isn’t as simple as putting it on a trailer and dropping it on a piece of land. Usually months of work are involved from preparing the land to renovating the home once it’s placed. It’s a huge undertaking, but Russ has never shied away from hard work when beautifying a home was a possibility. The work began early in March 2004. Preparing the home to move was a full-time endeavor. It took four months to get ready. The most difficult job was deconstructing the top floor to avoid issues with overhead fiber optic lines on moving day. We planned to also transfer the beautiful rhododendrons and bulbs that had been part of the house’s landscape for several decades, but the night before Russ arrive with buckets to dig them up, someone had come and helped themselves to the plants. On Sunday, June 6, 2004, the day of the house move, Susan (Motschenbacher) Gerretsen gathered across the street with longtime friends and neighbors to bid farewell to her childhood home. I recently spoke to her on the phone and she remembers being grateful that this piece of history would be safe. Anyone who has moved will tell you it is always stressful. Moving an entire house takes it to a whole new level. With tarps on the roof and boards over windows, Russ and our daughter Rachel walked behind the sad looking structure during its move. We often tell people that it looked like Dorothy’s house from the Wizard of Oz after it was dropped on the wicked witch. For several months, Russ spent 10- to 18-hour days building up the foundation and restoring the old home. It was ready to be occupied by February 2005. Landscaping and finishing touches would come later. For the past 10 years we’ve nestled in to our piece of Roseburg history. With joy we huddle together with family and friends, adding to the legacy of the home Mr. McClallen lovingly built for his descendants. The address may have changed but its purpose hasn’t. It’s still a place to fill with laughter as we build on the loving legacy of other generations. This story originally appeared in the News Review.